The NSW Government is considering de-regulation of the Sydney-Bathurst air route and Bathurst Regional Council is seeking comment from the community about the proposal. Mayor of Bathurst Cr Gary Rush said a review of the Bathurst-Sydney route by the State Government is part of a review of a number of intrastate routes and four Sydney-linked routes have been deregulated since 2016. “The Sydney-Bathurst route is currently operated under an air transport licence which is in place until 28 March 2018, unless that is varied sooner. It is a vital transport route for the city and local businesses and residents as it provides fast, reliable access to Sydney on a daily basis. “The State Government’s report into regional aviation services recommended that Transport for NSW consult with councils who have regulated air routes to discuss if deregulation is preferable for the air routes. “Council is seeking feedback from the community about the review of the air route and possible deregulation and this feedback will be collated and provided to Transport for NSW and the State Government. “We need to provide to the government by 28 February, and we are seeking comment from the local community throughout January, with submissions needed to be lodged with Council by 31 January,” Cr Rush said. 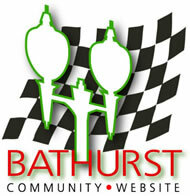 Submissions can be lodged with Council in writing or via the yoursay.bathurst.nsw.gov.au website. A new fund to support the creation of regional events and foster the development of existing community events has been announced by the NSW Government. Member for Bathurst Paul Toole said registrations are now open for round one of the 2017 Incubator Event Fund for organisers of new and emerging regional events held between January and June 2017, are invited to submit applications for funding. "The new Incubator Event Fund, part of the expanded Regional Flagship Events Program, provides one-off annual grants of up to $20,000. Managed by the State’s tourism and major events agency Destination NSW, the 2017 Incubator Event Fund will extend our calendar of regional events and foster development of events in their infancy to grow attendance beyond their local community, which is a huge boost for our overnight visitor economy," Mr Toole said. NSW Minister for Trade, Tourism and Major Events Stuart Ayres said the new fund will help expand our popular Regional NSW Events Calendar which already features a diverse range of food and wine, arts, music, and sporting events. "Regional events have an important role in taking visitors on an incredible journey through NSW, showcasing our destinations, our attractions and regional communities, while bringing economic benefit to the regions," Mr Ayres said. Destination NSW Chief Executive Officer Sandra Chipchase encouraged event organisers who are staging an event for the first or second time, to review the fund criteria and learn more about the opportunities on offer. "The Fund will assist with elements including event staging costs such as venue hire, marketing and publicity to drive event awareness and attendance, and research to better understand audience demographics and plan for future growth," Ms Chipchase said. Applications for Round One of the 2017 Incubator Event Fund are open until Sunday 30 October 2016 with Round Two applications for events held in July – December 2017, set to open in February next year. Tickets are now on sale for Bathurst Regional Council’s BizWeek feature event, the BizWeek lunch with guest speaker Mark Bouris. Mayor of Bathurst Cr Gary Rush said BizWeek was introduced in 2015 to highlight the diversity and strength of our local business community and due to overwhelming support has returned in 2016. "BizWeek will run from 15 to 22 September and is part of our ongoing Bathurst Buy Local Campaign which encourages residents to shop locally and support our local businesses." "One of the feature events of the week is the BizWeek lunch and this year we are excited to have Executive Chairman of Yellow Brick Road Wealth Management and host of the Celebrity Apprentice Australia, Mark Bouris as guest speaker." "Tickets for the popular lunch are on sale and I expect they will sell out quickly. Last year, we had a capacity crowd for the inaugural BizWeek lunch featuring Todd Sampson, and I expect this year will be no different," Cr Rush said. 22 September – BizWeek lunch with keynote speaker Mark Bouris sponsored by Verto and Oxygen Recruitment. The Bathurst Business Chamber will host the Carillon Business Awards on 9 September. Community members can now view the consultation report summarising feedback on the proposed upgrade of Chifley Road between Bell and Lithgow. Member for Bathurst Paul Toole said the NSW Government has provided $4.1 million to plan the upgrade which aims to improve safety and travel conditions. "The Bells Line of Road corridor, which includes Chifley Road, is a key corridor linking the western suburbs of Sydney with the west of NSW and carries about 3000 vehicles through Bell every day." The majority of feedback received on the proposal was supportive and Roads and Maritime will now finalise the concept design and environmental assessment. Further community feedback will be sought on the concept design and Review of Environmental Factors later this year. To view the community consultation report visit www.rms.nsw.gov.au. The recipient of the 2016 Bathurst Macquarie Heritage Medal, Professor Robyn Sloggett AM has been described by her peers as a contemporary hero of understanding and protecting cultural heritage both in Australia and internationally. Mayor of Bathurst Cr Gary Rush announced Prof. Sloggett as winner of the prestigious $25,000 national prize at a dinner in Australia’s oldest inland European settlement, Bathurst, on Saturday night. The Medal was first awarded in 2015 as a Bathurst bicentenary legacy, recognising an individual who demonstrates a significant contribution to the protection or promotion of Australia’s built, social, cultural or environmental heritage. Cr Rush said Bathurst is committed to valuing the protection of its heritage and the Bathurst Macquarie Heritage Medal was created to promote these values to a national audience. Cr Rush said Prof. Sloggett was selected from an impressive short-list field of four finalists for the award, which included cultural heritage specialist Christine (Chris) Johnston, heritage conservation architect Elizabeth Vines OAM and natural heritage conservationist David Clark. “Robyn represents all that the Bathurst Macquarie Heritage Medal stands for, an individual who demonstrates a significant contribution to the protection of Australia’s heritage. “Her work in heritage conservation, and in particular her work to assist remote Indigenous communities to work on heritage and art conservation issues has resulted in an exchange of knowledge between conservators in large institutions in southern Australia and senior Indigenous knowledge holders and practitioners. Robyn has been responsible for developing partnerships in training, collection management, preservation and digitisation of artist’s works and documentation. “Robyn’s research is grounded in the belief that strengthening research capacity in heritage conservation and mentoring the next generation of researchers is essential to the conservation of culture across Australia,” Cr Rush said. Prof. Sloggett said it was a privilege to have been nominated for the Bathurst Macquarie Heritage Medal and there was nothing more she would rather be doing in than helping people share their stories and their heritage, and secure it for the future. She said she intends to use the award to promote a more coordinated and nationally integrated approach to heritage and contemporary conservation. Bathurst area residents will now be able to use their Opal cards to travel on the Bathurst to Lithgow NSW TrainLink coach services, Member for Bathurst Paul Toole announced today. In a win for customers, anyone using the coach service to travel from Bathurst to Lithgow to connect with a NSW TrainLink Intercity rail service will be able to use their Opal card for the entire trip from 1 January 2016. "At the moment customers who use the daily Bathurst Bullet train service to Sydney can travel the whole way on their Opal card," Mr Toole said. "But many customers who use the coach service from Bathurst to Lithgow train station to connect with more frequent rail services have been hit with two fares – one for the coach leg, and one for the train journey from Lithgow onwards." "Residents have expressed their concerns to me about the different rules. That’s why I’m delighted to announce today that everyone will be able to use their Opal card on any journey they make from Bathurst to Sydney and return on a NSW TrainLink coach service." Mr Toole said this was particularly good news for seniors and pensioners with a Gold Opal card. "They will now be able to travel on the coach to Lithgow, board the train and get where they need to go for just $2.50 a day – they won’t need to pay a separate fare for the coach leg of their journey." "And it means anyone visiting Bathurst from the Sydney region can use their Opal card to travel to Lithgow and continue their journey without having to get another ticket, as long as they reserve a seat on the coach." "With Pensioner Excursion Tickets and other paper tickets being phased out from 1 January this means it’s more important than ever for local residents to get their Opal card." 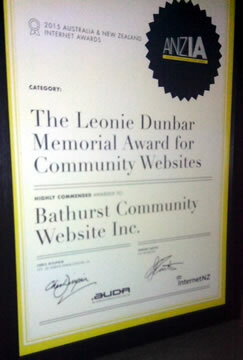 Bathurst Community Website (BCW) received a highly commended in the ANZIA Awards announced today. With the award winner being the Tamahere Forum website from Tamahere, Waikato, New Zealand this means the BCW site was the highest placed Australian community website at the awards. The ANZIAs (Australia and New Zealand Internet Awards) are a collaboration between auDA and InternetNZ. An annual event celebrating the achievements of organisations, businesses and individuals who excel in delivering accessible, innovative, informative and secure resources to a diverse and wide community on the Internet. Mercedes AMG have brought a range of new and existing models to Mount Panorama for the AMG Challenge Bathurst. Staff, customers, media and dealers will have the chance to drive the impressive line-up of vehicles in a no expense spared event that involves booking out the Rydges Mount Panorama and flying in participants with Virgin Australia. BCW have been shortlisted as a finalist for the 2015 ANZIAs under the category of The Leonie Dunbar Memorial Award for Community Websites! Winners for the category will be announced at the awards ceremony on 27 August, in Auckland, New Zealand.